When purchasing, ask the manufacturer of the child-restraint system which type of childrestraint system is appropriate for your child and vehicle. Child-restraint systems are classifi ed into the following 5 groups according to the UNECE 44 regulation. Please comply with the legal regulations concerning the use of child-restraint systems in your country. (Europe) In this owner's manual, explanation of child-restraint systems secured with seat belts is provided for the following three types of popular child-restraint systems: baby seat, child seat, junior seat. Installation position is determined by the type of child-restraint system. Always read the manufacturer's instructions and this owner's manual carefully. Due to variations in the design of child-restraint systems, vehicle seats and seat belts, all child-restraint systems may not fi t all seating positions. Before purchasing a childrestraint system, it should be tested in the specifi c vehicle seating position (or positions) where it is intended to be used. If a previously purchased child-restraint system does not fi t, you may need to purchase a different one that will. Equal to Group 0 and 0 of the UNECE 44 regulation. Equal to Group 1 of the UNECE 44 regulation. Equal to Group 2 and 3 of the UNECE 44 regulation. A baby seat is used in the rear-facing position only. Refer to the table, “Child-Restraint System Suitability for Various Seat Positions” for baby seat installation position (page 2-32 ). Always install a baby seat in the correct seat position: Installing a baby seat without fi rst consulting the table “Child-Restraint System Suitability for Various Seat Positions” is dangerous. A baby seat installed on the wrong seat position cannot be properly secured. In a collision, the child could hit something or someone in the vehicle and be seriously injured or even killed. Never use a rear-facing child-restraint system on the front passenger seat protected by an air bag: NEVER use a rearward facing child restraint on a seat protected by an ACTIVE AIRBAG in front of it, DEATH or SERIOUS INJURY to the CHILD can occur. 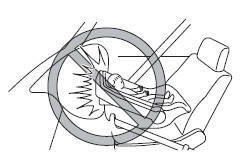 The child-restraint system can be hit by the deploying air bag and knocked out of position. A child in the childrestraint system could be seriously injured or killed. If your vehicle is equipped with a front passenger air bag deactivation switch, always set the switch to the OFF position if installing a rear-facing child-restraint system on the front passenger seat is unavoidable. A child seat is used in front-facing and rear-facing positions depending on the age and size of the child. When installing, follow the manufacturer's instructions in accordance with the appropriate age and size of the child as well as the directions for installing the child-restraint system. Refer to the table, “Child-Restraint System Suitability for Various Seat Positions” for child seat installation position (page 2-32 ). Always install a front-facing child seat in the correct seat position: Installing a front-facing child seat without fi rst consulting the table “Child-Restraint System Suitability for Various Seat Positions” is dangerous. A front-facing child seat installed on the wrong seat position cannot be properly secured. In a collision, the child could hit something or someone in the vehicle and be seriously injured or even killed. Never install a front-facing child seat in the wrong seat position: Installing a front-facing child seat without fi rst consulting the table “Child-Restraint System Suitability for Various Seat Positions” is dangerous. A front-facing child seat installed in the wrong seat position cannot be properly secured. In a collision, the child could hit something or someone in the vehicle and be seriously injured or even killed. Do not install a front-facing childrestraint system on the front passenger seat unless it is unavoidable: In a collision, the force of a deploying air bag could cause serious injury or death to the child. If installing a frontfacing child-restraint system on the front passenger seat is unavoidable, move the front passenger seat as far back as possible and make sure that the front passenger air bag deactivation switch is in the OFF position. Refer to Front Passenger Air Bag Deactivation Switch (page 2-46 ). A junior seat is used in the front-facing position only. Refer to the table, “Child-Restraint System Suitability for Various Seat Positions” for junior seat installation position (page 2-32 ). Always install a junior seat in the correct seat position: Installing a junior seat without fi rst consulting the table “Child-Restraint System Suitability for Various Seat Positions” is dangerous. A junior seat installed on the wrong seat position cannot be properly secured. In a collision, the child could hit something or someone in the vehicle and be seriously injured or even killed.